The contribution to greatest understandings do not come from a single person’s vision; it comes with thousands of great and lesser minds who work together to create a better change. Open Source is similar to this; it enables larger groups of people to work together for a common goal. It is a good way to realize the issues then just miserly hoarding the knowledge. Open source medium allows you to share your knowledge with the world and see what they are up to with it. In this age it is important to understand that along with conquering the software world, Open Source is actually extending itself into many realms. It is defining the interaction and collaboration among people, the individual-level motivations, and behaviors towards organizational adaptations. Globally, much advancement is taking place for making people realize the importance of Open Source. The open source community is working to find innovative ideas and define the future of open computing through collaboration of talented people. As Pakistan is also becoming a hub of open source technologies, many efforts are being put forward in order to bring together industry experts to advocate the development and use of Open Source in the country. 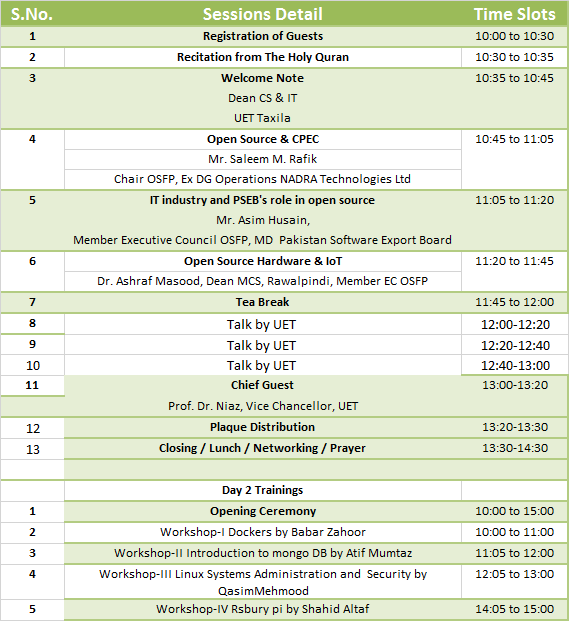 For this purpose, a conference is taking place on 26th October in UET Taxila which is named as OSS16. Conducted by OSFP, in collaboration with PSEB, It will bring together IT experts, business executives, Defense department, Chamber of commerce, and academia to explain the impacts of Open Source in the society. Most of the well-known scholars from academia and industry will be actively participating to share their knowledge and provide people with an opportunity to learn about impacts of open source in the society. The OSS16 conference is an ideal platform for people to stay informed with the latest trends in the industry. This conference will offer a broad range of topics and will provide an exciting opportunity to exchange ideas with other community members. These contributions will always be greater than the sum of its parts and you will be able to change the world in your own smaller ways.